Presentations which can be viewed directly online (rather than having to be downloaded first) are very cool things to work with and a really good free platform for these is SlideRocket, to where I intend to upload a few of mine as well. 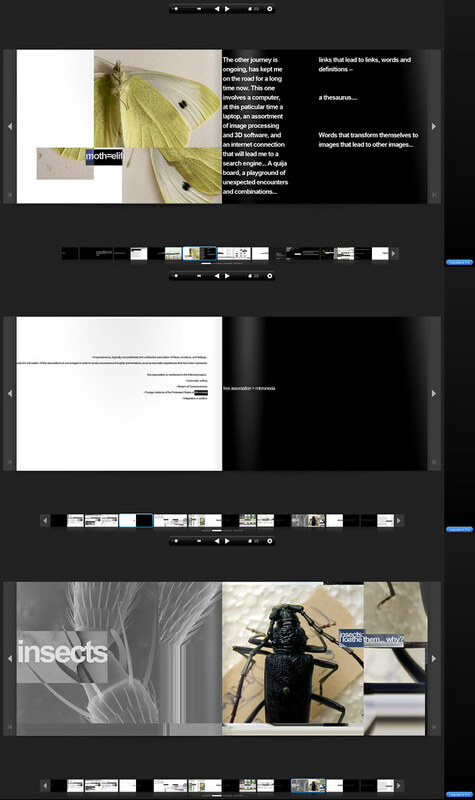 http://issuu.com/elifayiter/docs/the-bridge-project (when you reach the page click on the thumbnail to view fullscreen). Note: The flipbooks which I am showing/linking to above were made for my own pleasure. I used my old powerpoint slides for them, however they were never used as presentations as you are seeing them here. If I were to make a flipbook as a presentation I would opt for a portrait format on the individual pages, so that the left and the right hand page add up to a total which is roughly a 4 by 3 ratio – which will of course fill the screen/projector in a much more efficient way. An html website can also become a very good presentation medium: You simply press function key 11 (F11) on the keyboard to make the browser fullscreen and start scrolling down to access the content. An example of where I used html to make a presentation is the Bridge Project. You do not need to know html or have your own website to be able to do this: There are very good online intuitive html authoring platforms where you can assemble a webpage for presentation purposes and then even publish your content for free. Weebly lets you create blogs as well as websites. They have a very beautiful template gallery from which you can start out and then everything works with a simple drag and drop interface which lets you add pretty much all that you could ever wish for. The second one Yola works in a similar way, also very easy to use and versatile. And then another way to go for an html presentation are of course tumblr blogs, which are completely free as well. Another way of making a presentation is through a mindmap. This is particularly good for complex, non-linear presentations of work in progress, which you would make to closed research groups. I would not advise anyone to do this for a normal, 20 minute long public conference presentation since these types of presentations will be much harder to navigate through. In fact you should probably rehearse these presentations a good few times before you actually go ahead and make them to your colleagues. They are good for situations where you may be jumping back and forth between topics and may wish to compare different aspects of your work side by side and in different combinations. The two screenshots above are from a long presentation which I made for my PhD project in 2006. Above is the closed view and below a view in which some of the nodes of the mindmap have been exploded/popped open. 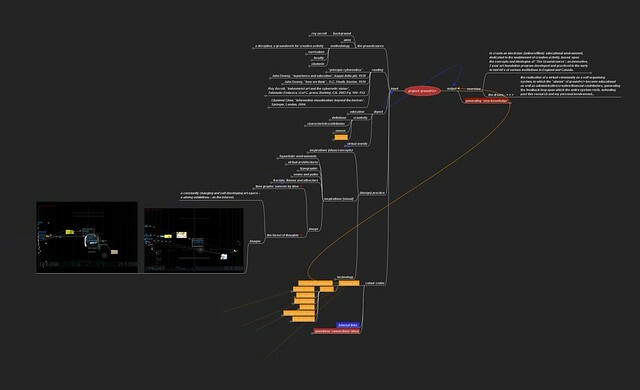 This was an hour long and very complex delivery where I had to make a lot of comparisons and show correlations between different parts of my research and so using a mindmap rather than a linear structured slideshow was the better option. The structure which I described on this page under the heading “structure” is still here however: The introduction is the central red node. The left branch is where I am contextualizing my work (the “background/overview” section). The right side branches into two, where I am tackling the current state of my work, in other words the “body” of the presentation in the upper branch (which in this screenshot is still closed). 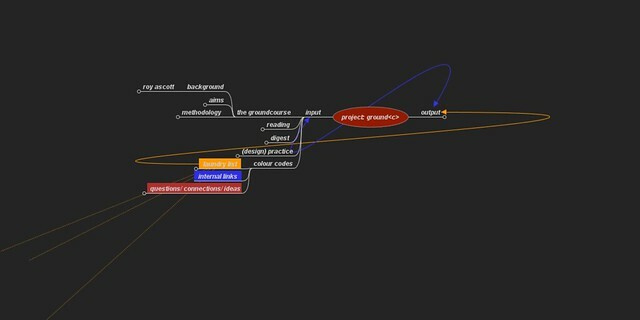 And the conclusion is the lower right branch which is entitled the “dream”, which is at that stage was short enough to just consist of one single node of text (and has changed completely between then and now, I should add… ;-). At the far left bottom is also a legend for the colors with which I am coding certain nodes into groups. The application which I used is freemind, and this is a freeware tool which you can download from here >>>. You can add nodes and branches to this starting from a central main node. The nodes can contain pretty much anything you want, from text and images to URLs. These nodes and branches can be popped open and closed by clicking on them, thus hiding and revealing things as you move along. The whole interface is zoomable, so you can focus upon individual elements and then zoom back out to show how they connect to everything else. You can also link different nodes with internal arrows. Be aware that the work area will look nothing like this when you first open the software. I customized the dark background and all the other colors from the properties menu. Unless you are running your own server a freemind mindmap cannot be viewed online but has to be downloaded and opened with the installed software. So, the computer you intend to show this on has to have the application in it already. Another really great online application with which you can make presentations that are zoomable is Prezi! Go go go, register right now and check it out! Lots of fun! And, of course you can make absolutely stunning presentations using flash. A very good online platform for this is wix, which is highly intuitive and they may even have special presentation templates. (I should add that I didn’t specifically check for them, so don’t hold me down to this but go and find out for yourself). But regardless of whether they do or not, their general templates are so customizable that you can tweak them endlessly to fit your exact design preferences and content. Note: Almost all of my papers and presentations can be found as download links on this page >>>.